More than 65 miles of trails of every level are open year-round for day use free of charge. Most trails are open to hikers, bikers, and equestrians. Our backbone multi-use trail – the Coast to Crest Trail – extends from the ocean at Del Mar to the San Dieguito River’s source on Volcan Mountain near Julian. Today, we have about 48 miles of the planned 71 miles of the Coast to Crest Trail completed. In addition, over 20 miles of auxiliary trails within the River Park are open. Auxiliary trails are not part of the Coast to Crest Trail, and may have limited use regulations which will be clearly noted. City of San Diego– Crest Canyon, Gonzales Canyon, Black Mountain, and Clevenger Canyon. County of San Diego– Lusardi Creek, Del Dios Highlands, Santa Ysabel West and East, and Volcan Mountain Wilderness Preserves. City of Del Mar– River Path Del Mar. Cleveland National Forest– Upper Santa Ysabel and Lower Santa Ysabel Truck Trails. Specific trail alignments will be developed in cooperation with landowners and leaseholders in order to minimize impacts to existing use, such as farming, cattle ranching, and private residences. See the Park’s policy on Private Property Rights Protection. When our trails get soaked after a rain, we encourage everyone to wait 48 hours before using them to let the trails dry out. Bicycle tires, horse hooves, and even shoes and dog paws can damage the trail tread while it is soft and muddy, and this can cause further erosion during subsequent storms. Thank you. For your safety and the preservation of sensitive habitat, please observe and obey all posted park regulations on the trails and staging areas. Off-trail activities damage valuable habitat. Repeated violations risk the closure of trail segments. Be familiar with the general Park Rules prior to your visit. Use this interactive San Dieguito River Park Google Map to plan your trip. Click the + or – signs on the lower left corner to zoom in or out. Click on the top left box with an arrow to bring up a menu of all the different parking areas (P symbols), trail segments, and points of interest (arrow pointing to the star symbols). Clicking on an individual parking area, trail segment, or point of interest will bring up more information about it. (For trail segments, you may need to uncheck the Focused Planning Area first.) The Coast to Crest Trail is shown in blue. Auxiliary trails are shown in orange. The San Dieguito River Park Focused Planning Area is in purple. Printable trail maps are also available below. Click here to view the San Dieguito River Park Google Map in a larger window. 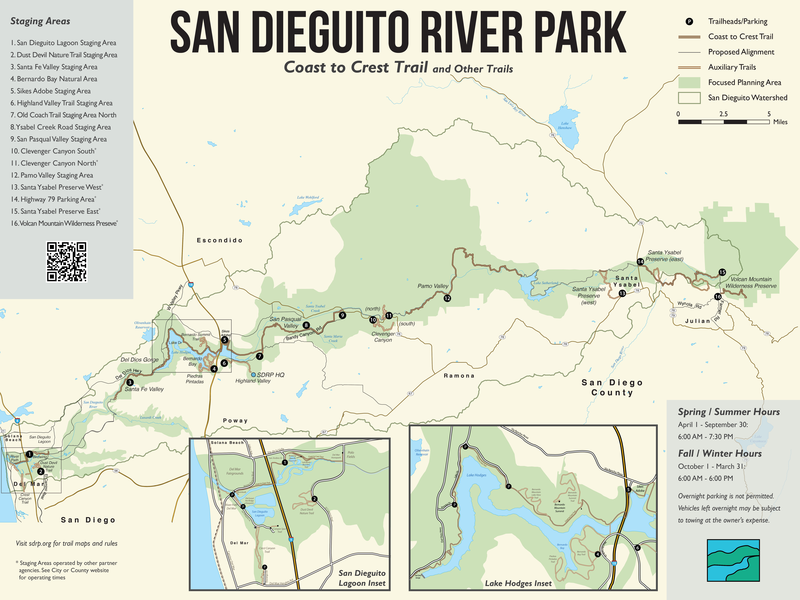 Click here to download the San Dieguito River Park Map. Click on the trail name or directions to download a PDF file of the trail map or directions for where to park. Trail maps are typically available free of charge at interpretive kiosks along the trails. Bicycle Pedestrian Bridge– Open 6am to 9pm daily.